This is the background story to a wedding in our building on December 26, 1910 with 700 guests, officiated by Rabbi Philip Klein of Ohab Zedek, First Hungarian Orthodox Congregation. A case in the Second District Municipal Court, in Madison Street [59 Madison Street -ed.] will lead today to a wedding in the Lower East Side. Both the bride and the bridegroom are lawyers. They met in the Madison Street Court several weeks ago, one as defending counsel, the other as counsel for the complainant, and their friends say that each was deeply impressed with the skill the other displayed in handling the case. The bridegroom is Harris Koppelman, whose office is at 302 Broadway. He is a member of the Congregation Ohab Zedek, on Norfolk Street. The bride is Esther Kunstler, daughter of Felix Kunstler, a real estate dealer of 158 Rivington Street. ..The case was won by Miss Kunstler’s client. When Miss Kunstler and Mr. Koppelman left court, however, they were best friends. By January the wedding report became news in society columns. 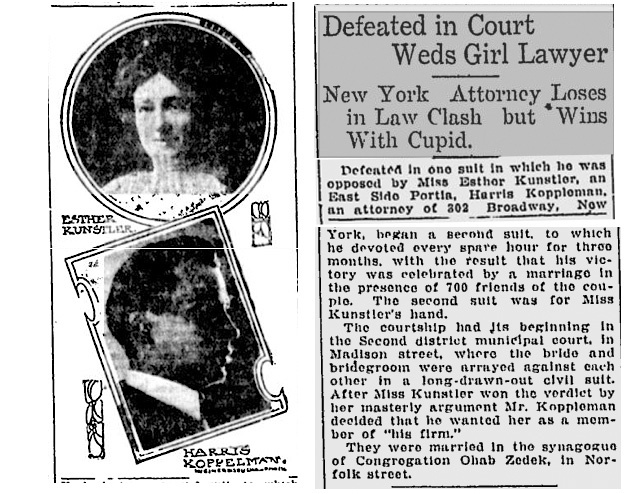 This is a faded picture of bride and groom with the headline ” Defeated in Court – Weds Girl Lawyer – New York Attorney Loses in Law Clash but Wins with Cupid” on page 3 of the Spokane Daily Chronicle, January 5, 1911. She talks to judge and jury in a “winning manner”, and her witticism keeps everybody in good humor. She generally creates somewhat of a sensation when she appears in a courtroom, for she looks more like a school girl than a lawyer. As she speaks six languages fluently, her list of clients grown steadily. Many of the poor whose rights she has championed look upon her as a sort of angel upon earth. She loves her profession, and her father says that it is hardly likely that she will ever abandon it to marry. On this question Ms. Kunstler is uncommunicative. “My work is my life” – she said. I am happiest when I am defending some of my clients. It is a great work and I hope to make my mark some day. 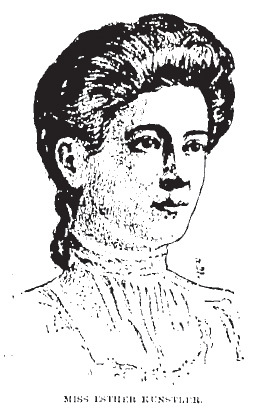 (Boston Advocate Oct 26, 1906 via syndication from The Globe).